Whizz up 2 ripe avocados, juice of lemon, a handful of parsley and dill, 3 stalks of eschallots, garlic, chilli and 1/4 cup olive oil. Season. With a mandolin, shred 2 zucchini and cook in a fry pan for a few minutes with slow roasted cherry tomatoes. 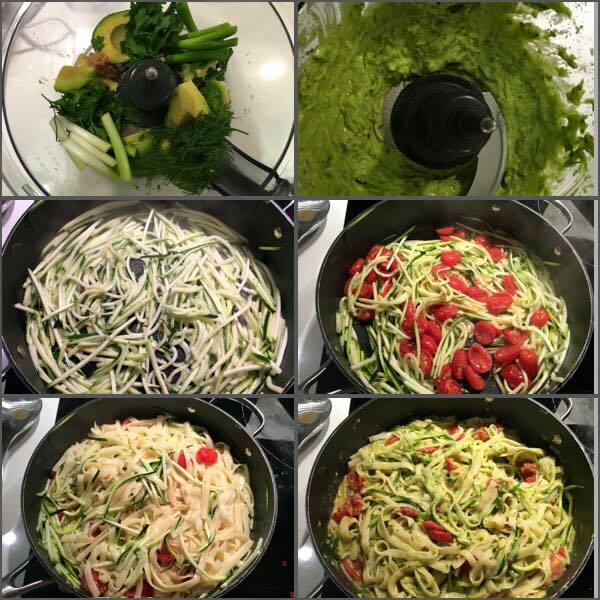 Add cooked pasta to pan along with avocado sauce. Toss and heat through. It tastes soooo creamy, but no cream!